Seems like a reasonable step until USP6 is available, but as you know I've always been a proponent of the all-inclusive option. It would seem that the fewer files involved from the user's perspective, the easier an install will be and the less likely to screw it up by either leaving something out or adding something you shouldn't. But I'm not actively using Win2K right now, so take my input with a grain of salt. Still I appreciate your opinion very much! There are so many W2K updates to slipstream/install at the moment (around 300 files including official, HBRs & unofficial) that even I myself get confused all the time so I don't even try to imagine how an avarage user feels when looking at the updates list for the first time. The number of unofficial updates is growing very quickly (around 50 at the moment) so I believe that something must be done about it. I'm sure you are right. You, Bristols and BlackWingCat are the three main ones spearheading active development it seems. But rest assured your work is appreciated. I think that is an usefull project to reduce the number of HF. I've prepared a beta version of Unofficial Updates Rollup. It's created 100% automatically by a script without any manual work involved. This is a multilanguage version. I'm working on the English one (many more English only updates included) but it's quite tricky and much more complicated. I tested the global version in HFSLIP (no difference between integrating the rollup and integrating the single updates) and also in a VM. No problems occured. By the way, in the next few days I'm going to rearrange the first post to include the rollup and also other updates added by acus, brutus1234 & myself. Last edited by tomasz86 on Tue Mar 06, 2012 1:23 pm, edited 2 times in total. I prepared a BETA2 of UU Rollup. I haven't added any more updates yet but there were a few bugs which I've fixed, ex. not all files were installed the rollup was installed in a running system (slipstreaming worked fine). I'm sure there're still other issues to be fixed though. Last edited by tomasz86 on Sat Mar 10, 2012 5:06 pm, edited 1 time in total. I've prepared a BETA3 of UU Rollup (Global). I've added KB927489 and fixed some issues with manual uninstall and reinstall. I think I haven't said it before but this rollup does not require unofficial kernel to work. Last edited by tomasz86 on Sun Mar 11, 2012 8:29 pm, edited 2 times in total. Unofficial Updates Rollup (BETA4) ready. I've added Services, True Type Fonts (TTF) Pack and Script 5.8. There was also a mistake in all previous versions - the official 972270 is not replaced by the rollup. And I think I haven't mentioned it before but of course UU Rollup is fully compatible with HFSLIP. Last edited by tomasz86 on Tue Mar 13, 2012 3:36 am, edited 1 time in total. EDIT: There was a small bug in BETA5. Please use BETA5a instead. I've prepared a BETA5 of Unofficial Updates Rollup. I've only fixed some bugs. This one is very likely to be the final version. Last edited by tomasz86 on Fri Mar 16, 2012 11:59 pm, edited 1 time in total. Thanks for a quick fix, acus Probably no one has noticed but there the uninstaller of the 2598479 v1 was in Japanese. I've already downloaded 350 files but it's still a long way to go. If anyone is willing to help, please send me a PM. You don't need to download a lot of updates - just a few would still be very appreciated. The task is very simple - you download files in all available languages for each HBR, make an archive and upload it somewhere so I can download and use it to make the rollup. Of course we should talk before in order to prevent overlapping of HBRs. I've finally managed to finish the two versions of Unofficial Updates Rollup. It's available for ENU & Global (non-ENU) systems. The main difference between the two is that there are more (English-only) updates included in the former and I've also managed to merge the two kernels - WB kernel & BWC kernel into the ENU version. I just chose compatible files from each of them and included in the Rollup. Now it's no longer necessary to choose between the two. You can use the Rollup as long as you've got SP4 & UR1 installed. Because both unofficial kernels are included you don't need to install any other unofficial updates or other packages before installing the UU Rollup. Of course you can also slipstream it as it's 100% compatible with HFSLIP. Please check #1 post for details. I've started working on a new version of Update Rollup 2. This is just a very first alpha. I'm sure there are some bugs in it. UR1 is not yet included. Last edited by tomasz86 on Mon Mar 19, 2012 3:17 am, edited 3 times in total. Everything worked fine but today MediaFire seems to have problems with URLs that include filename :/ I've changed them to standard ones. Thanks for your kind words. UU Rollup has been very heavily tested and you shouldn't experience any issues when using it but please be careful with the alpha versions of UR2. They are still in the very beginning stage of development and I'm sure there are many bugs to be fixed. 1) UU Rollup - it will be updated as soon as new UUs are released. 2) HBR Rollup - it's absolutely necessary to merge the ~200 HBRs; there are just too many of them. 3) UR2 - this time there is no place for manual work and mistakes resulting from it (because 99% of work is done by a script) so it will be final. These are not that large as for their size but require quite a lot of work because of many packages using non-standard format. After everything is ready then I'm going to focus on preparing the USP6. I have uploaded UU Rollup v2. I've removed the custom update 2347290 because, after all, it's not a UU I'll include it in the upcoming Unofficial Update Rollup 2. I've also decided to try a different host this time. MediaFire's been getting on my nerves for some time - its interface is extremely slow (even though it's a quad-core here; and I use ramdisk for browser cache) and the download counter doesn't seem to work correctly recently. BlackWingCat has just released a new version of his kernel and this time I'm thinking about switching from WB's kernel32.dll to BWC's kernel32.dll in the UU Rollup. It seems that BWC has added a lot of APIs to his kernel32.dll in meanwhile and the two are not that much different at the moment. I have started to edit the first post. I added a short explanation about UUs and info about UU Rollup. I'm also going to add all other updates (currently removed but backed up here), including the ones made by acus. I've also prepared ALPHA2 of UR2. This time UR1 is included It seems to work fine both for manual installation and HFSLIP. The result of slipstreaming in HFSLIP is exactly the same as if you slipstreamed all these single updates. Actually it's even better as OCSASNFix.exe and the newest rdpwd.sys are already included in it while you'd have to put them in HFSVCPACK_SW1 normally. By the way, what do you think about Ge.tt? Are there any problems with downloading? I like it a lot as it's extremaly simple and very fast compared to the previously used MediaFire. Thanks for the link to Ge.tt - I hadn't heard of them before. Kind of like dropbox at first glance. My2GirlsDad wrote: After a few more tests I found out that this update breaks anything installed after it until the machine is rebooted. After reboot windows installer works fine. Due to this situation the hotfix should be the last item in HFSVCPACK_SW2. If its not the last item anything installed after it will not install correctly. It's a late reply but I've tested it any it doesn't work if KB971913 is put in SW2. I think you meant SW1, didn't you? The last item in SW1? Actually I think the problem is that the Installer service is not restarted when this update is installed. I'll try to modify it a little bit and see if there's any positive effect. tomasz86 wrote: It's a late reply but I've tested it any it doesn't work if KB971913 is put in SW2. I think you meant SW1, didn't you? The last item in SW1? I have Silverlight 4 in SW2 so that's why I need to put it there. Otherwise I would put it in SW1. Does it install when you put in in SW2?? I only get a message about available switches during Windows installation, meaning that the switch set by HFSLIP is incorrent. It's installed only when I put it in SW1. I've added a 2K compatible version of Microsoft Runtime Libraries Collection(x86) addon. Please check the first post for details. My2GirlsDad wrote: The switch HFSLIP applies is for SW2 so I have to modify SVCPACK.INF changing the switch to /quiet /norestart (used for SW1) then it installs. UURollup-v3 (ENU) is ready. I have fixed a bug causing Wordpad files being copied to a wrong folder. I've also added a few newer versions of updates and also two files from Windows Server 2003 (ntdetect.com & ntldr) which can make system booting a little faster (1-2 seconds). UURollup-v3a (ENU) is available. There was a minor bug in the last version. I also cannot install anything that uses or requires Microsoft Installer 3.1, such as VMware Tools. The OS appears to install MSI 3.1, but fails to execute msiexec and quits the setup with an error. Could this all be due to me attempting to install IE6 SP1 with the UURollup? I'll check the problem when l'm at home. Could you try to add the official M$ Update Rollup 1 to HF and try again? There are no M$I files in the UURollup. EDIT: Did you use nLite after HFSLIP? I can see. NET Framework addons in the log. By the way, the UURollup has only unofficial updates included so you must still slipstream all official packages like MSI 3.1 and other updates together with it. OK, so I have tested it and indeed Update Rollup 1 is required when you slipstream UURollup & IE6. I added the appropriate info to the first post. I've also forgotten to mention it but yesterday I uploaded a v3 of the Global version of UURollup. So are there plans to eventually have a single update pack with everything for the lazy among us, or a set of a very few, to allow you to have everything with the least amount of effort and the highest probability of success because of the thorough testing that has been done for compatibility? tomasz86 wrote: I'll check the problem when l'm at home. Could you try to add the official M$ Update Rollup 1 to HF and try again? Alright, I'm trying a build again with the update rollup 1, and msi 3.1 just to ensure that vmware doesn't need to install it to install vmware tools. I imagine all my issues were due to not including UR1. I'd love to see a UR1+UU package in the future, if possible, since it'd be essentially what SP5 should have been. Finally, after all of these are ready, I want to concentrate on the future new unofficial Service Pack where all of them will be included. Once I've got all these packages ready it will be much easier to merge them together into the USP than merging single updates. @tomasz86, since PROBLEMCHYLD is going tp work on a slimmed version, it might also be neat to see if Kurt_Aust would incorporate your work to make a full featured install. Just a thought. I just wanted to post an update: Including the update rollup 1 with your unofficial update worked. I do love seeing 2000 boot up with full color support in explorer. @jimmsta: I set minimal requirements for the UURollup to be SP4+UR1 but it probably works without the UR1 if you don't install IE6 at the same time. Still I think that omitting UR1 is not really a good idea so I'll leave it like this for both ENU & Global versions. @bphlpt: I'm aware of Kurt_Aust's work but as far as I can see he's focused on official packages only. Not totally. In his thread http://www.msfn.org/board/topic/97047-u ... ion-guide/, the second link he gives to download is "Unofficial Windows 2000 Service Pack 5.1.2195.24 Refresh", and it has been for years. If I can be so bold, I think the combined work of Bristols, BlackWingCat, WildBill, and yourself carries on in the spirit and tradition of Gurgelmeyer, and I would think that Kurt_Aust might at least consider a branch of his work that could include your work for increased functionality. Kurt has always valued stability, and until you, BWC and WB began putting out the quality of work that you all are beginning to do now, there has not seemed to be a stable option to compare with the venerable SP 5.1. While there are some purists that want Win2K completely original, I think that most who are interested in using Win2K either want it stripped lean and mean using something like fdv's fileset, or want it able to use all the latest versions of all the popular apps. In either of the latter two options, I think it works best if Win2K is "extended" using work such as yours for both safety and functionality. But that is only my opinion. Last edited by bphlpt on Tue Mar 27, 2012 11:55 pm, edited 1 time in total. I'm not sure if this is not too early to incorporate my packages into such a guideline. They're still in the developmental stage and will probably change a lot until the final new USP is ready. As for the USP itself, I plan to go one step further than Gurgelmeyer did and include packages such as .NET Framework and MS VC++ in it too apart from just including updates (OU, UU, HBR) only. I have updated the Microsoft Runtime Libraries Collection(x86) addon. It's based on the newest edition provided by ricktendo64 and I also modified its structure because the original one was designed for XP and not all files were copied correctly when used with Windows 2000. Now everything should work fine. Please check the first post if you want to download the new version. I have added UURollup v4 (ENU) & v3a (Global). In the ENU version there are two new files from BWC kernel added (psapi.dll & userenv.dll) and one updated (crypt32.dll). I've also integrated one more UU (978706-v2; thanks M2GD for reminding me about this one). I've also removed some unnecessary catalog files and slimmed down the update.inf file - it should now install a little faster than before. In case of the Global one I've just removed CATs and worked on the update.inf so you don't really need to install it if you've already installed the v3 version. They are based on addons created originally by OnePiece & YumeYao (the second one modified by ricktendo64). Click on "[Details]" next to each one if you want more information. I've also added URLs to the .NET 1.1SP1 & 2.0SP2 true addons by OnePiece. Please check info about HFSLIP & OnePiece .NET True Addons (the "*" sign under Addons). To avoid all potential problems I'll probably make a one big .NET Framework package (1.1+2.0+3.0+3.5+4.0). As I said, I prepared a one big Microsoft .NET Framework True Addon in which .NET Frameworks 1.1 SP1, 2.0 SP2, 3.5 SP1 & 4.0 are included. All original files come from OnePiece, the DLLs either from XP or BlackWingCat's KDW. 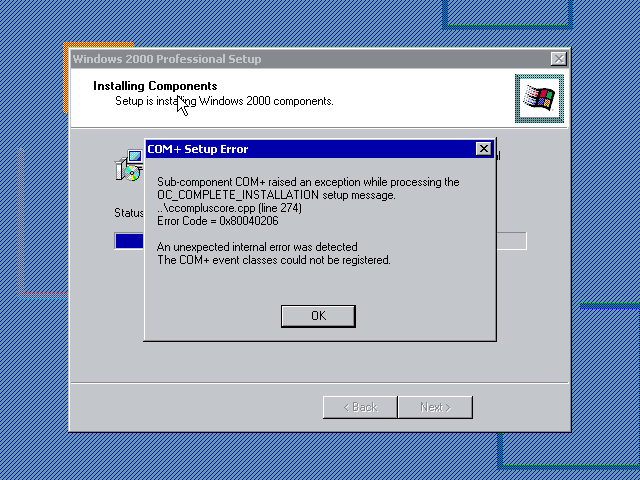 I only fixed some dependencies and repacked them to this addon work under Windows 2000. Fortunately there are just a few files in .NET 3.0 and 4.0 sources that need to be "fixed". The rest work fine thanks to the unofficial kernels (files from which are included in UURollup (ENU)). You can find the URL in the first post. * It is not possible to uninstall .NET v1.1 SP1. 1) The next alpha of UR2. I fixed one bug and added MSXML. 2) Together with acus we've finally managed to download all the 5000 hotfixes by request available for all 24 supported languages. The is a very first alpha of the ENU version. It is a truly massive rollup - 159 hotfixes (about 370 files) are included in it! I tried all your 3 Rollup Packs with HFSLIP (and then install W2K PRO in Virtual Machine). All seems works fine!! Great job. 1. HBR KB843530 (W2K Server) contains binlsvc.dll, present also in w2k Pro. 2. All files present in HBR KB889330-v2 (W2K Server) are present in driver.cab also in w2k Pro, while tape.sys is present in I386 folder. EDIT: shlwapi.dll seems to be fine; it's probably one of the other files from 979687 to cause this issue. It happens only when the file had been slipstreamed (integrated) into the Windows source and then Windows was installed from it, and then M$ Office was installed. I've been trying to find the reason for many hours but I still need to do more tests later (I've got no more time today). It would be very nice if someone could check this issue on his/her machine. UURollup-v4 is temporarily not available to download until the issue is resolved. The Global version is unaffected by the problem. Last edited by tomasz86 on Tue Apr 03, 2012 4:31 am, edited 1 time in total. As you can see, the official one has newer version number even though it itself is older than the first one. When you already have 924432 installed in your system and then install 979687, you will still end up with ole32.dll 5.0.2195.7103 because the installer won't overwrite a file with higher version. On the other hand, when you use HFSLIP to slipstream the two updates, ole32.dll 5.0.2195.7060 will be slipstreamed as it has newer date (not version) than ole32.dll 5.0.2195.7103. I didn't experience the issue when the update was installed manually simply because the file was not replaced I checked it once again - once you replace the buggy ole32.dll 5.0.2195.7060 with ole32.dll 5.0.2195.7103 and restart the system, Microsoft Equation works fine! - ole32.dll 5.0.2195.7103 has been added so it will always overwrite the buggy ole32.dll 5.0.2195.7060 when you install the Rollup manually. - shlwapi.dll has been updated to 6.0.2800.2015 (from BWC kernel). - Microsoft Runtime Libraries Collection 2.1.3 True Addon has been integrated into the UURollup. It's no longer necessary to use it separately. I've also added Windows PowerShell 1.0 for Windows 2000 to the list. It requires UURollup (ENU) and can be slipstreamed from HFSVCPACK_SW1 in HFSLIP. 1. First of all, I want to thank everyone installing and testing it. No matter how diligently I test it here there are always very diffirent setups and very different hardware / software configurations so it's just not possible to detect all potential problems / bugs / faults by one person. 2. I believe the current version (v5) is almost perfect when it comes to comprehensiveness and stability. All unofficial updates (except those going to HFSVCPACK_SW1*) present on the Windows updates list are included together with some other files (ntldr & ntdetect.com form W2K3, MSVC++ libraries, etc.). I haven't experienced any issues with it except the one related to the buggy ole32.dll. 3. The Global version is quite limited when you compare it to the ENU one but I can't really do much more with it. The biggest problem is of course that most of the UUs are available only in English (or CHT/ENU/JPN in case of BWC updates). Nevertheless, I'll try add some language neutral files from the unofficial kernels later on. 4. So what's next? I want to take the UURollup to the next level. I've been working on integrating IE6/OE6 core files and all HBRs & UUs present on the IE list. It requries some time to do as the original IE6 installer inf files use a completely different structure than the ones from Windows updates (UURollup uses standard Windows update format). After that I'd like to do the same with DX9, WMP9(or maybe 10) and MDAC 2.81 (this is going to be hardest one...). Please inform me if there are any updates / files missing from the UURollup. I'm open to any feedback (and constructive criticism too ). * It's impossible to add those updates and keep HFSLIP HF folder compatibility at the same time. Does anyone have a full list of updates for WMP10? I've found this but the last update was on 2011/6/29.